CAPE CANAVERAL, Fla. ? It's a pretty good day to be ElonMusk. The chief executive of SpaceX had plenty to celebrate today(Dec. 8), after the milestone first test flight of the private spaceflight company'sunmanned Dragon space capsule. "It's just mind-blowingly awesome," Musk said in anews briefing after the spacecraft had returned from orbit. "It's hard tobe articulate when your mind's blown ? but in a very good way." "I can't tell you how excited I am," NASAAdministrator Charles Bolden told SpaceNews, a SPACE.com partner, at an event at NASA headquarters in Washington today. "The important thing for everybody to understand is that this is the firsttime that something other than a nation has done ascent, on-orbit and intactrecovery." SpaceX's successful mission is also a landmark for thecommercial spaceflight industry as a whole. It was the first test flight underNASA's Commercial Orbital Transportation Services (COTS) program, which isdesigned to foster the development of privatevehicles capable of carrying cargo and crew to the International SpaceStation. SpaceX plans to use its unmanned Dragon spacecraft as the cargo truck to deliver supplies to the International Space Station under a $1.6 billion deal with NASA. That contract calls for 12 SpaceX Dragon flights to the space station through 2016. NASA has also struck a $1.9 billion deal with another company, Orbital Sciences of Virginia, for eight cargo flights using its private spacecraft and rockets. "What a great day for SpaceX, what a great day forNASA, and what a historic day for commercial spaceflight," said AlanLindenmoyer, program manager of NASA's Commercial Crew and Cargo Program. "This is an indication that this experiment is working. Thispublic-private partnership has certainly shown to be successful today." 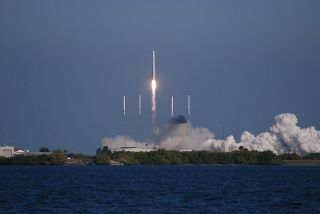 SpaceX's first operational Dragon spacecraft launchedaboard the company's Falcon 9 rocket at 10:43 a.m. EST (1543 GMT) from the Cape Canaveral Air Force Station's LaunchComplex 40. The capsule made two orbits of the Earth at speedsgreater than 17,000 mph (over 27,300 kilometers per hour), according to SpaceXofficials. It then re-entered the Earth's atmosphere and splashed down in thePacific Ocean shortly after 2 p.m. EST (1900 GMT). The entire mission lasted almost3 hours and 20 minutes. "This has really been better than I expected,"Musk said. "Just looking at all the mission data ? it's almost too good.For a rocket to work, and a spacecraft to work ? they're both incrediblycomplex devices. So much can go wrong but, it all went right. I'm sort of insemi-shock." In addition to founding Hawthorne,Calif.-based SpaceX in 2002, Musk co-founded the Internet payment service Paypal,and is CEO of the Tesla electric car company. The smooth operation of this demonstration flight couldhelp Musk, and other potential commercial providers, quiet some of the criticsof commercial spaceflight. After today's success, Musk said that doubting thecapability of the private space industry "wouldn't make sense. It would belike fighting on the wrong side of yesterday's war." Yet amid the celebration, SpaceX already has its eye on thenext round of test flights in the COTS program. ? "In our schedules with NASA, it said that if thisflight went well, it would allow us to go straight to the space station in thenext one," Musk said. "We have to carefully examine the data fromthis mission, but I'm optimistic that the next flight will be to the spacestation." "We're beyond the 'if' for 'if it's possible,'"said Gwynne Shotwell, president of SpaceX. "Now we can move forward andget stuff done." Space News Staff Writer Amy Svitak contributed to thisreport from Washington, D.C.